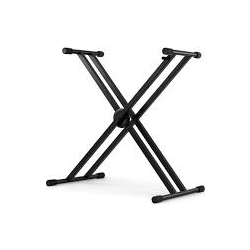 Nomad NKS K139 Keyboard Stand is an affordable, high quality X-type opton.. This Nomad Keyboard X Stand sturdily supports anything with a long flat base, like orchestra bells, glockenspiels, synthesizers, or trap tables. Its double-x design can support up to 176 pounds, while non-slip rubber caps on the feet keep it from moving around on you. You can switch between several locked-in height options quickly and easily by squeezing the lever near the middle. When you're done with the gig, this stand folds up for easier storage.